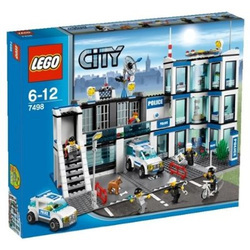 Lego City Police Station is right at the forefront of fighting crime in Lego City! The prisoners might be trying to escape via the drain, but you'll soon round them up using the police car. Then, lock the evidence in the evidence room, take their mug shots, and lock your criminals securely in the cells before you can say say "You're nicked, mate"! A superb play set for all Lego fans with plenty of figures included for hours of law-abiding fun. Click to see an Amazon video! "We bought this for my daughter's 6th birthday as she loves Lego. Thinking I would get to help proved to be wrong. The clear instructions and well laid out diagrams, as usual from Lego, meant that my daughter has been occupied for hours and still isn't finished. She is addicted to this latest addition to her Lego City collection. Another great piece and well worth the asking price, although we did find the discounted price on Amazon more attractive."